When we think of dogs, large houses and open fields come to mind. However, in today’s rapidly urbanizing world, there are not many such spaces to live in. Does this mean us city dwellers stuck in smaller living arrangements shouldn’t own dogs? Definitely not! In fact, dogs living in apartments can be just as satisfied as any other canine. All you really need to keep a dog happy is have a heart full of love and the ability to care for its needs. So, if you want a dog, but are hesitating to get one because you live in an apartment, don’t lose hope! This article will tell you how you can keep your dog happy and well cared for in a smaller living space. The general rule is that smaller dog breeds like the Chihuahua, the French Bulldog Dachshunds, and the Yorkshire Terriers are better fitted for the apartment lifestyle. They won’t grow as big, so they won’t need as much space! Also, in apartment homes, noise tends to be a big issue. So, you might want to get breeds that are quiet and won’t disturb the neighbors. A popular dog breed known to be quiet in nature is the Cavalier King Charles Spaniel. It’s very important that you research dog breeds and their various needs and traits before actually getting one. Also, if you already have a dog that’s noisy, you could always soundproof the walls. Your dog needs to be able to roam around freely, without the risk of getting hurt. It also needs to feel comfortable where it’s staying. So, when you get a dog, you’ve definitely got to make your apartment more dog-friendly. First of all, install childproof latches on all cabinets, especially ones that have cleaning agents or medication. Also, dogs tend to chew on everything to make sure there aren’t any wires that are loose or easily accessible. The chewing doesn’t just stop at wires. Plants are a dog’s favorite chewing dish as well. The problem here is that sometimes they can be toxic. So, it’s best to keep houseplants out of reach. Just like us, dogs need their own separate place to hang out by themselves. The best way to do this in an apartment is by getting your dog a crate. You can choose from a variety of options that range from lightweight to heavy duty crates. The type and size of the crate you should get depend on the size and breed of your dog. Since dogs like to live in dens, having a nook to themselves is very important. You could even place their bed beneath a table to give them the feeling of a den. Since your dog will be home all day, splurge a little and buy it lots of toys. The poor creature will be home alone so it will definitely need some entertainment and stimulation. Dogs love toys, especially ones they can chew and puzzles that they can solve. You could also invest in the Kong Toy which sends out treats throughout the day. Treat dispensers are a great way to keep your dog motivated and happy. However, make sure you keep the treats healthy. Also, here’s an important tip. Don’t leave your dog with bones to chew on because these can actually splinter and choke your dog. Toys are a way better option! Despite all the indoor entertainment, a dog still needs to be outdoors. The best way you can do this is taking your dog on regular walks every day. You should also take your dog to the closest dog park at least once a week. This will allow your dog to socialize with people and other dogs, as well as get the exercise and fresh air it needs. If you’re a pet owner who works, it’s only normal to wonder about what your pet might be doing at home all day. Or at least I think it’s normal because I definitely do! If you’re as obsessed with your pet as I am, you could install a webcam to keep an eye on your dog. And no, I’m not suggesting this only so you’re able to admire your dog during your breaks at work, although it’s one of the plus points. A webcam is actually a really good investment because you’ll know if your dog is in danger or if it’s being naughty. You can also speak through the webcam. Hearing your voice will be calming for your dog. Nowadays there are a lot of dog daycare centers that you can enroll your dog into. 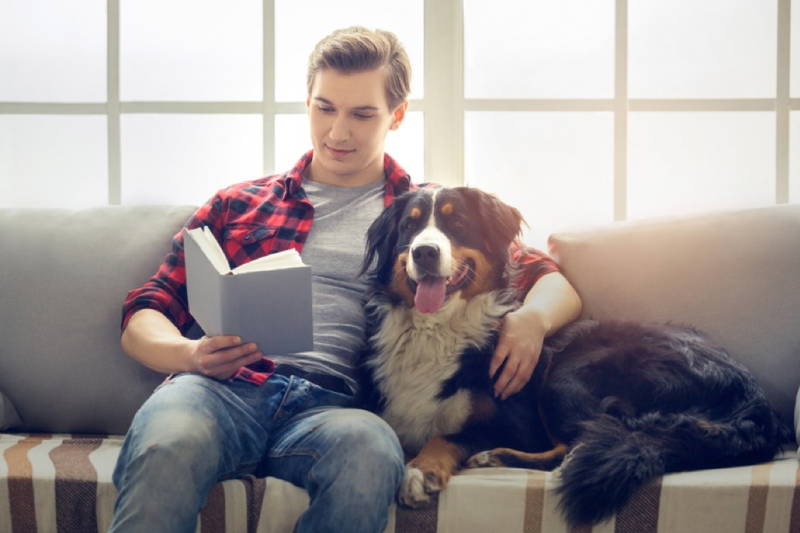 It’s a great option if you’re out every day because your dog will have the company of other dogs as well as some much-needed human interaction. Also, if you’re not getting the time to walk your dog, hire a dog walker, or ask a friend or neighbor. Never skip on the walks because exercise will keep your dog in a happier mood and make it less anxious. Dogs need some sort of routine in their lives. Having a set time for everything will actually help your dog adjust better to living in an apartment. Start by giving your dog its meals at specific times. If it knows when to expect food, it won’t act out. Follow the same rule for training, play time and walks. Also, make sure you give your dog enough time during the weekends. The weekends should be filled with visits to the park and other activities that your dog will enjoy doing with you. After reading this article, I’m sure you’ve realized that keeping a dog happy in an apartment is not too difficult. Here’s a warning though- your dog might suffer from separation anxiety the first few days. But don’t worry, with time, this too will be fixed! Just make sure you spend quality time with your dog and give it all the care it needs. Opening the doors of your home to a dog will not only give it a happy life, but it will also give you a reason to look forward to coming home. So, what are you waiting for? Go ahead and give a dog the loving home it deserves! Shawn is a content writer at FeedFond. He is a loving father not only to his two children but also to his two Golden Retrievers. To read more of his articles, visit FeedFond.com.